Innovative presentation skill training resource Time to Market Ltd has announced that its new training centre is now open for presentation training in Liverpool. Located in Liverpool’s central business district the new training venue benefits from superb transport links: three railway stations, busy bus routes, the M62 motorway and the Mersey tunnel are all nearby. With its state of the art training facilities the centre can accommodate a range of training requirements, class sizes and audio-visual requirements. Excellent catering and parking are both available for presentation training participants. Commenting on the new Liverpool centre, Andrew Ivey (Principal Trainer) said, “I’m delighted that we are now in a position to offer presentation training in Liverpool. It’s an important development for us and our clients. You can train to be a confident presenter with presentation training in Liverpool. We offer a range of presentation skills training courses: for you, for groups, for full days or half days—available for all abilities. You can train to be a confident presenter in Liverpool, so you won’t need to travel far. Presentation training in Liverpool includes full refreshments and lunch during the day’s session, expert help and advice and all the training materials you need. 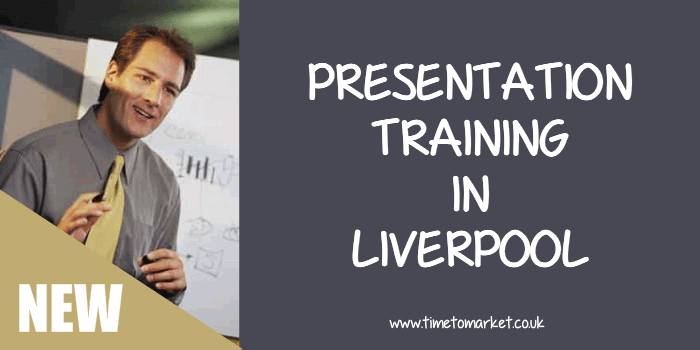 So, to find out how you can become a confident presenter and improve your presentation skills in Liverpool, please don’t hesitate to get in touch or email training@timetomarket.co.uk.